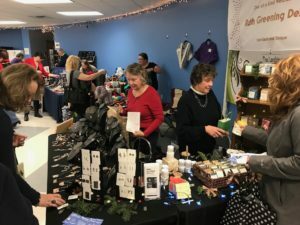 Craft fairs are the ideal places to shop during the holiday season, and with a variety of events in Thurston County, be prepared to shop until you drop. Fairs and bazaars often have a fun festive atmosphere, free admission, and plenty of activities. Fairs offer gifts that keep on giving back to the community as they are a great place to find handcrafted, local, one-of-a-kind items that you can feel good about. Oftentimes, your dollar goes into the pocket of a local family. Plus, many craft fairs benefit local causes. Without further ado, here are just some of the fairs and bazaars happening in Thurston County this November and December. 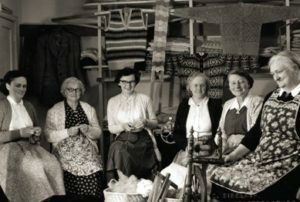 Hand-crafted items made by Panorama residents, including jewelry, wood work, quilts, knit goods, metal shop items, pottery, Christmas decorations, and art of all kinds. Raffle items including gift baskets and quilts. When: November 16-17, 9:00 a.m. – 3:00 p.m. Handmade wood toys and ornaments, leather goods, scroll saw art, crochet items, jewelry, bird houses and feeders, live wreaths, walking sticks, many fabric crafts, hunting and pocket knives, Watkins products, and many more vendors with great gift ideas. When: November 16, 9:00 a.m. – 5:00 p.m. and November 17, 9:00 a.m. – 4:00 p.m. This even has vendors returning and many new vendors for an array of gifts to purchase and enjoy. Expect a delicious lunch available, as well as an assortment of baked goods for sale for dessert. Benefits: All proceeds go toward helping local veterans and their families. When: November 17, 9:00 a.m. – 4:00 p.m.
A variety of crafters, student crafters, and direct sales businesses, including Scentsy and LuLaRoe, will be at this annual bazaar. When: November 17, 9:00 a.m. – 3:00 p.m.
Over 170 vendors with items like antiques and handmade crafts, candles, jewelry, wood items, jams, ceramics, garden decor, metal art, and holiday items to name a few. There will be a raffle, plus concessions, and childcare available. Benefits: This event is a fundraiser for the OHS Associated Student Body (ASB). Also, collecting donations for the Thurston County Fook Bank. Old-fashioned bake sale, handcrafts, artwork, raffle, white elephant table, and more. Two floors of vendors and artists in historic house for holiday shopping. 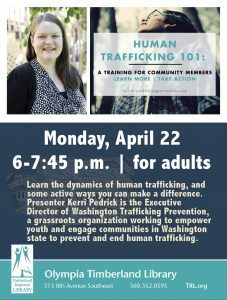 Benefits: All proceeds go to scholarships and local community projects by The Woman’s Club of Olympia. This bazaar offers fresh noble fir wreaths and swags, handcrafted wooden items, themed gift baskets, knitted, crocheted and quilted items, Christmas decor, fresh nuts, homemade cookies, candy, bakery items sold by the pound. Coffee, tea, sweets are available at the snack bar. Benefits: Many social service organizations. Three full buildings with more than 80 vendors, food trucks, kids’ arts and crafts, and raffles. 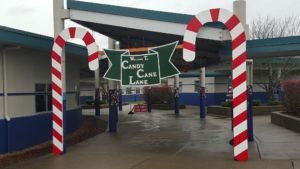 Santa and Mrs. Claus will be passing out treats on Saturday from 10:00 a.m. – 12:00 p.m. and again at 2:00 p.m. – 4:00 p.m. with free admission and parking. When: November 23 and 24, 9:00 a.m. – 5:00 p.m. and November 25, 10:00 a.m. – 4:00 p.m.
Seahawk-themed items, jewelry, home decorating items, paintings, and quilts. There will be several items for raffle. Sponsored by Delphi Pioneer Family Chapel. Benefits: Fundraising for Children’s Hospital, and please bring clean, slightly used warm socks, gloves and beanies for distribution to homeless and low income. Charity bake sale benefits local low-income students. When: November 24, 10:00 a.m. – 3:00 p.m.
Come support Small Business Saturday, and shop over 100 local artisan booths. Benefits: Bring non-perishable food donations for the Thurston County Food Bank. Every two articles of food or dollar donated gets you one raffle ticket to win one of many prizes donated by our talented vendors. When: November 24, 10:00 a.m. – 5:00 p.m.
Arts and crafts will range from jewelry and painting, to photography, printmaking, woodworking, metalworking, ceramics, natural and herbal products, stuffed animals, fiber arts and textiles, stickers and zines, and so much more. When: November 28, 11:00 a.m. – 4:00 p.m.
Where: Vendors will have tables throughout the 2nd floor of the CAB (College Activity Building) Evergreen State College. Features over 70 vendors, lunch, live entertainment by the wonderful Nehemiah Brown, pictures with Santa, gift wrapping, food collection, and much more. Festive shopping at the largest craft-fair in Thurston County, with more than 165 vendors specializing in handmade gifts and artwork. Offers entertainment, door prizes, and free photos with Frosty. When: December 1, 9:00 a.m. – 4:00 p.m.
70th Annual Winterfest is a holiday bazaar with over 40 vendors. Includes a raffle, silent auction, Scholastic Book Fair, Snowflake Café, free kids elf’s workshop, cake walk, photos with Santa. Benefits: Littlerock Elementary School’s PTO. Proceeds from this event will help fund a college scholarship, student enrichment programs, classroom allotments, teacher requests, field trip transportation for each grade, specialty assemblies, Olympia Junior Programs, family fun nights, and much more! When: December 1, 9:00 a.m. – 3:00 p.m. Featuring dozens of Native artists, offering original pieces for sale including weavings, carvings, jewelry, fine art prints, paintings, cards, drums, beadwork and clothing. 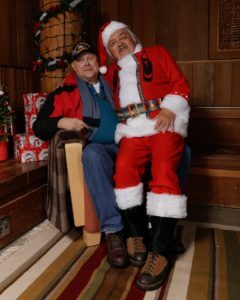 Salish Santa will be available for pictures from 1:00 p.m. – 4:00 p.m. both days ($10). When: December 7 and 8, 11:00 a.m. – 6:00 p.m. Featuring crafts like hats, scarves, wooden decor, soap, balm, and jewelry. When: December 7, 9:00 a.m. – 3:30 p.m.
More than 100 vendors featuring both commercial and handmade items like knitwear, wood and metal craft, jewelry, cards, wreaths, quilts, and more. 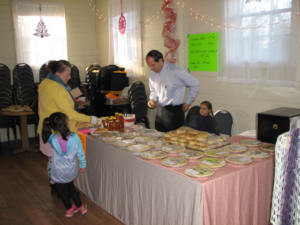 Available food products include pies, bread, jams, jellies, and honey, plus food trucks, and kettle corn. 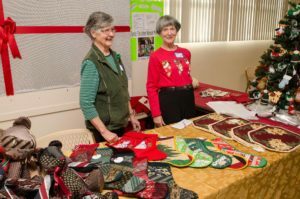 When: December 8, 10:00 a.m. – 4:00 p.m.
For more information on local bazaars and fairs, visit ThurstonTalk’s event calendar.